The Perth Mint has recently unveiled the design for the upcoming 2014 Australian Kookaburra Silver Coins. The .999 fine silver bullion coins will be available in three different sizes scheduled for worldwide release on September 2, 2013. The Kookaburra is best known for its unusual call, which sounds like human laughter. The Perth Mint has issued silver coins featuring the iconic Australian bird since 1990, with a new reverse design created annually. The reverse design for the latest release features a depiction of an adult kookaburra perched on a tree branch and surrounded by gum leaves. The inscriptions read “Australian Kookaburra” above, with the 2014 date and precious metal content indicated below. The Perth Mint’s “P” mint mark is also incorporated. On the obverse is the Ian Rank-Broadley effigy of Queen Elizabeth II, along with an indication of the legal tender face value. 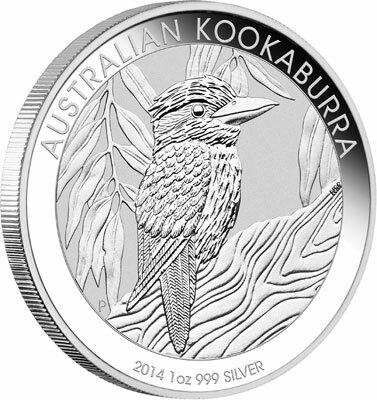 The 2014 Australian Kookaburra bullion coins will be available in 1 kilogram, 10 ounce, and 1 ounce sizes. A maximum mintage of 500,000 pieces has been established for the 1 oz size. No mintage limits apply to the remaining two sizes. All bullion coins are presented in protective acrylic capsules.